Today the mail truck came bearing packages and this second one felt like such a bonus because the truck stopped at our place, deposited a box on our doorstep, then left...the truck then went further along the route and about an hour later came back to us with package number two all the way from Malaysia. Aaron walked in with a little square box covered in world-worn brown paper affixed with stamps depicting birds and plant life native to Malaysia. I'm a non flyer so boxes from far off lands excite me more than most. 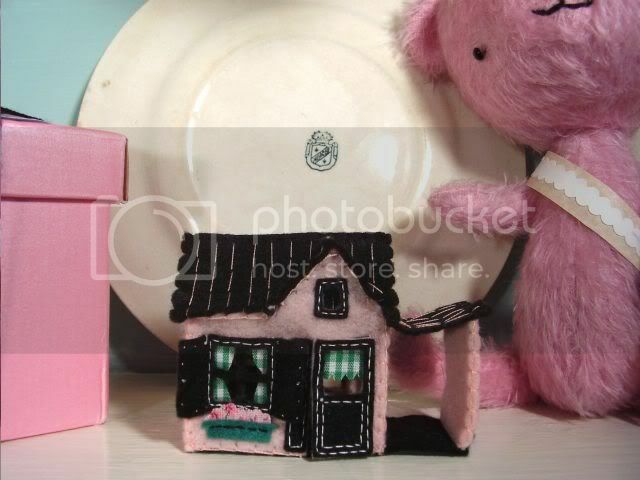 Will you get a load of this amazing little felt house I acquired in a trade with the amazing Esther from Flickr! The tiny door actually opens and how cool is it that she gave it a carport?!! Oh yeah, and wow about the packaging!! 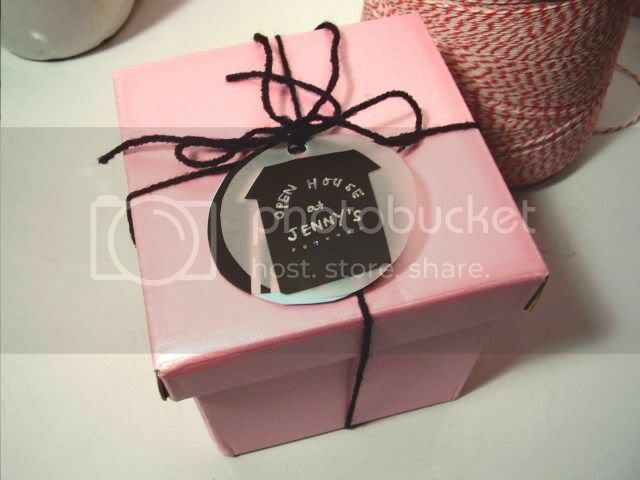 I didn't want to even open it...the handmade tag is just about the cutest thing I ever saw. The hand stitching on the house is impeccable...she pulled out all the stops on the detail work and from every angle it's drop dead sweet. Thank you SO SO much Esther!! You are soooo kind...and too darn talented!! We LOVE it!! WOW! That house is beyond fabulous! 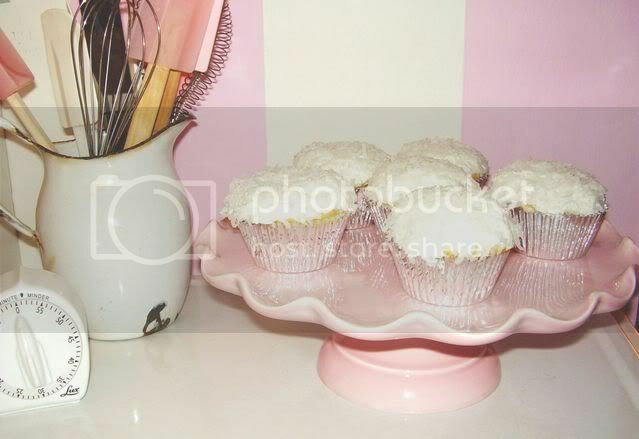 And those cupcakes look so yummy. mmmmmmmm! I LOVE coconut anything! 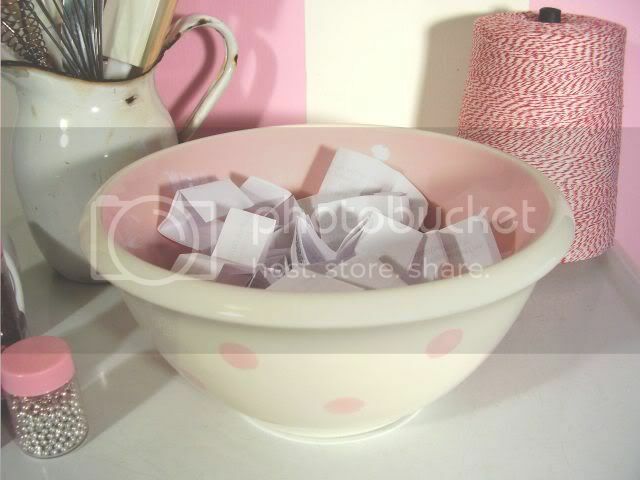 And that cute polka dot bowl you had the names in! Gracious!! 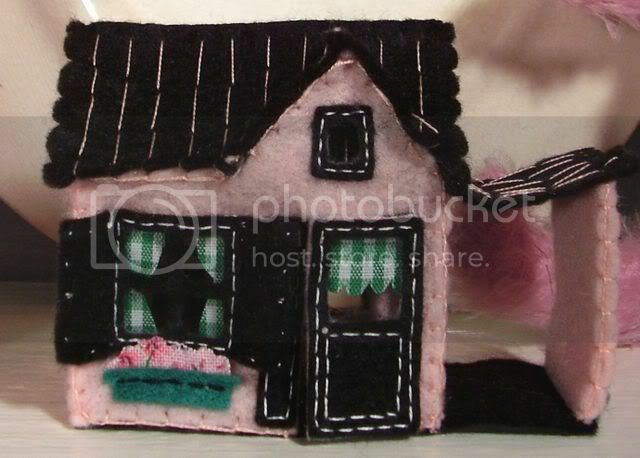 That little felt house is downright enchanting! And the packaging!!!! Lucky winner! Gotta LEOV that! Oops, I mean ...love that! 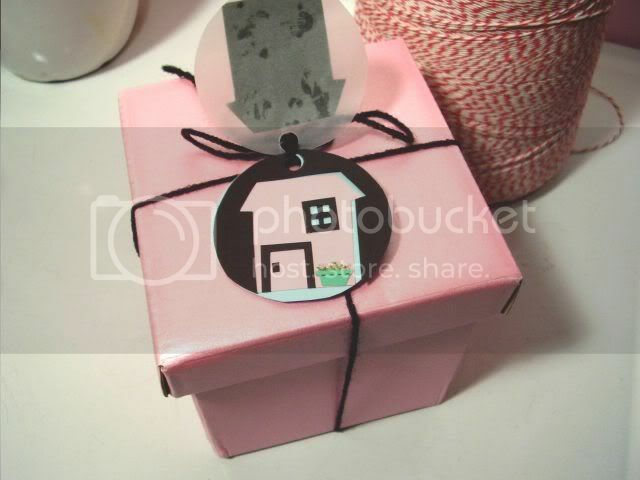 And that IS a really cute little house, such talent! Oh Jenny,I love your pictures,they are always so inspiring! I had no idea I was so drawn to pink! Cheers for the winner *rahrah*! I adore your photos...they make me feel ultra-girly! Where o where did you find the red and white string?! The felt house is amazing, how fun! yup, cuuuuuuutest pink house! amazing...cool for you. I just want the cupcakes. OH ~ I really do just love your blog and your creations! but Carrie will REALLy adore this little treasure! I see my dear friends name! Your site, Jenny ... Is dreamy! LOTs of time! Beautiful things. And the cakes ... yummers. I can't wait to come back and play here!